One page taken from a 64-page catalog which is almost as small (about 3 x 5) as the die-cast Matchbox cars themselves. Originally an exotic English product, now owned by Mattel. Any self-respecting 1960’s or 70’s-era boy could spend hours poring reviewing photos in an agonizing attempt to decide which models to spend his hard-earned allowance on next. 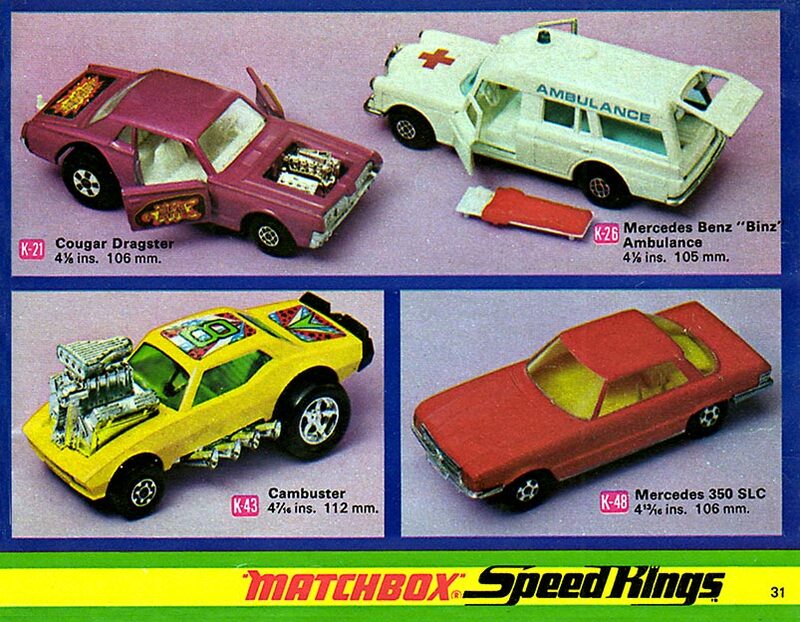 These “Speed King” models were larger than the average matchbox car at over 4 inches, the better to show of the motors, and — in this case, the tiny stretcher which is undoubtedly waiting to pick up the survivor of a crash between the Cambuster and the Cougar.